Black+Decker will be coming out with a pair of new 40V MAX (LCS1240) and 20V MAX (LCS1020) Lithium-Ion cordless chainsaws this November that they say provide the “convenience of cordless maneuverability” with “performance for cutting through dry wood and live logs”. Both models feature a tool-free chain tensioning system that do not require manual oiling. The LCS1020 oils using a traditional primer, while the LCS1240 eliminates priming and constantly keep the bar and chain lubricated. The LCS1240 has a 12-inch bar and chain and the LCS1020 has a 10-inch bar and chain, both being capable of handling many outdoor cutting chores. Since the Black+Decker chainsaw batteries are lithium-ion they are capable of holding their charge for up to 18 months, so even if you only use it a little a store it away, it should be ready to go when you next need it. The Black+Decker 40V MAX system powers 6 Outdoor Products, while the 20V MAX system powers more than 20 Outdoor Products, including Black+Decker power tools. 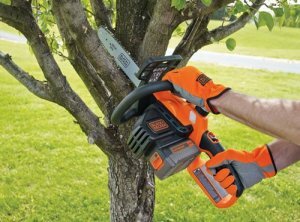 Both cordless chainsaw models should be available this November at a price of $199.99 for the LCS1240 40V MAX Lithium Chainsaw BUY - Amazon and $129.99 for the LCS1020 20V MAX Lithium Chainsaw BUY – Lowe’s.